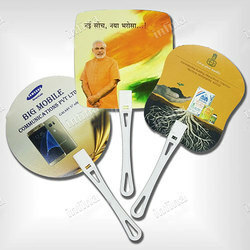 Manufacturer of a wide range of products which include plastic hand fans and promotional hand fans. Plastic Hand Fan is available in various colors and attractive designs and can be printed as per your requirement. Customize it to promote products, companies or brands.Moreover, being lightly weighted these Fans are very handy and convenient for Promotional activities. Our Promotional Hand Fans feature a large imprint area with a durable, waterproof plastic material that is sure to last in the harsher weather conditions. These products are available in various colors and attractive designs. Our range of these products comes with fine grip and a smooth handle. We use high quality of plastic to manufacture these products so, these remain durable. Moreover, being light weighted these Fans are very handy and convenient to use.